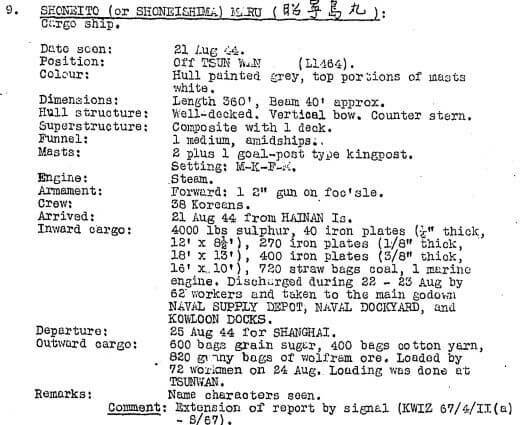 Elizabeth Ride has sent British Army Aid Group (BAAG) records of shipping movements in Hong Kong in 1944-45 during the Japanese occupation in World War Two. These provide information not only about the ships themselves but what cargo was being brought into and out of Hong Kong during the latter stages of WW2 and of godowns, docks etc that were being utilised. The Shoneito (or Shoneishma) Maru was seen off Tsuen Wan on 21st August 1944 arriving from Hainan Island, China. Arrived on 21st August 1944 from Hainan Island. Departed on 25th August 1944 for Shanghai. Outward cargo: 600 bags of grain sugar, 400 bags of cotton yarn, 820 gunny bags of wolfram ore, loaded by 72 workmen on 24th August at Tsuen Wan. Supplementary information: The only wolfram/tungsten mine in Hong Kong at that time was Needle Hill. See our article about the mine during this period linked below in related articles. This article was first posted on 5th June 2016.